InGaAs, or indium gallium arsenide, is an alloy of gallium arsenide and indium arsenide. In a more general sense, it belongs to the InGaAsP quaternary system that consists of alloys of indium arsenide (InAs), gallium arsenide (GaAs), indium phosphide (InP), and gallium phosphide (GaP). As gallium and indium belong to Group III of the Periodic Table, and arsenic and phosphorous belong to Group V, these binary materials and their alloys are all III-V compound semiconductors. To a large extent, the electrical and optical properties of a semiconductor depend on its energy bandgap and whether the bandgap is "direct" or "indirect." The energy bandgaps of the 4 binary members of the InGaAsP quaternary system range from 0.33 eV (InAs) to 2.25 eV (GaP), with InP (1.29 eV) and GaAs (1.43 eV) falling in between. At SUI we emphasize photodetectors, so we care most about the optical properties of semiconductors. A semiconductor will only detect light with photon energy larger than the bandgap, or put another way, with a wavelength shorter than the cutoff wavelength associated with the bandgap. This "long wavelength cutoff" works out to 3.75 µm for InAs and 0.55 µm for GaP with InP at 0.96 µm and GaAs at 0.87 µm. Let's get back to InGaAs.. The InAs/GaAs alloy is referred to as InxGa1-xAs where x is the proportion of InAs and 1-x is the proportion of GaAs. The lattice constants and long wavelength cutoffs of these alloys are depicted as the red lines in Figure 1. The challenge is that while it's possible to make thin films of InxGa1-xAs by a number of techniques, a substrate is required to hold up the thin film. If the thin film and the substrate do not have the same lattice constant, then the properties of the thin film will be severely degraded. For lots of reasons, the most convenient substrate for InxGa1-xAs is InP. High quality InP substrates are available with diameters as large as 100 mm. 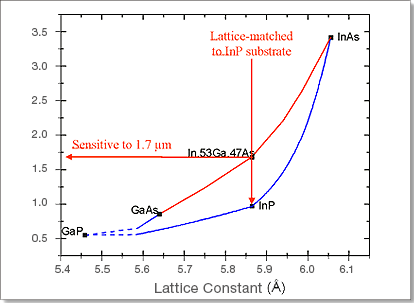 InxGa1-xAs with 53% InAs is often called "standard InGaAs" without bothering to note the values of "x" or "1-x" because it has the same lattice constant as InP and therefore the combination leads to very high quality thin films. So what is "extended wavelength" InGaAs and why bother? 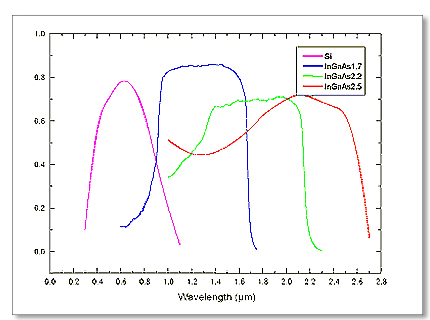 Standard InGaAs has a long wavelength cutoff of 1.68 µm. 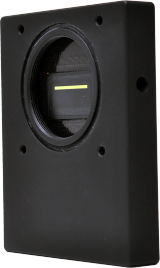 Many applications require the detection of light with longer wavelengths. An important example is the ability to measure moisture content in agricultural products by measuring water absorption at 1.9 µm. Another example is "LIDAR" (light detection and ranging), used in airplanes to detect clear air turbulence. LIDAR systems often use lasers that emit light with a wavelength of 2.05 µm. InxGa1-xAs with a longer cutoff is called "extended wavelength InGaAs." It seems as if all one would have to do is add a little more InAs to the mix, but it's not so easy. This increases the lattice constant of the thin film, which causes a mismatch with the substrate, and this reduces the quality of the thin film. SUI has put a lot of work into learning to grow high quality extended wavelength InGaAs, and this is reflected in our product offerings. The results of our efforts are summarized in Figure 2. Figure 2 shows the quantum efficiency of standard InGaAs in blue together with the quantum efficiencies of two extended wavelength alloys, X=0.74 (green) and X=0.82 (red). The spectral response of silicon is also shown. As we like to say, "InxGa1-xAs starts where silicon leaves off."